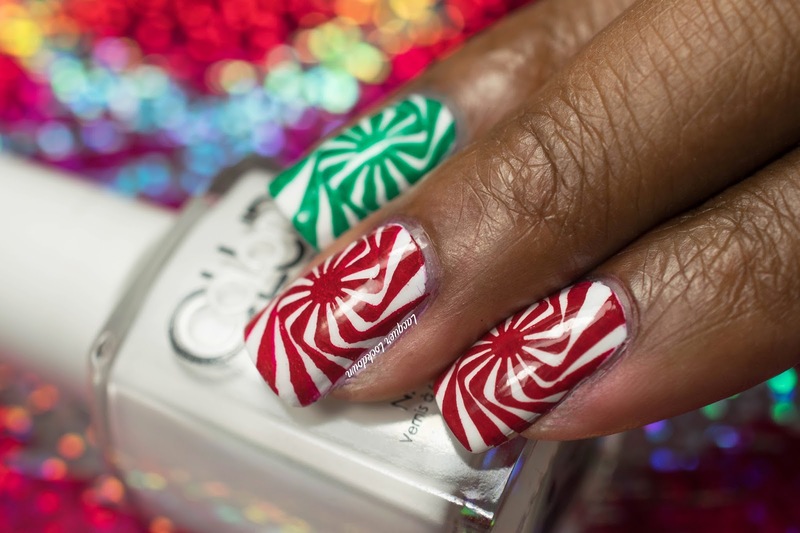 Lacquer Lockdown: Christmas Simples: MoYou London Candy Cane Swirl Nail Art + Tutorial! Christmas Simples: MoYou London Candy Cane Swirl Nail Art + Tutorial! How is everyone's weekend? It's amazingly warm here in mid December on the east coast which pretty much means the end of days is coming, but it also means the weather is utterly decadent! I don't know whether to be happy or scared. Lol in either case it doesn't really feel like winter however we are moving on with the Christmas Simples series. This time candy canes. 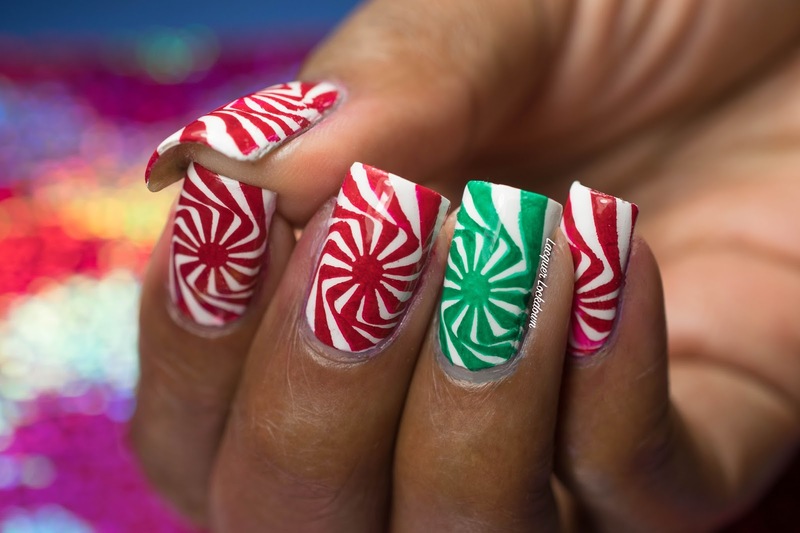 I actually had another one planned, but they popped off before I could get photos :/ In any case candy canes are classic and cute for christmas nail art. 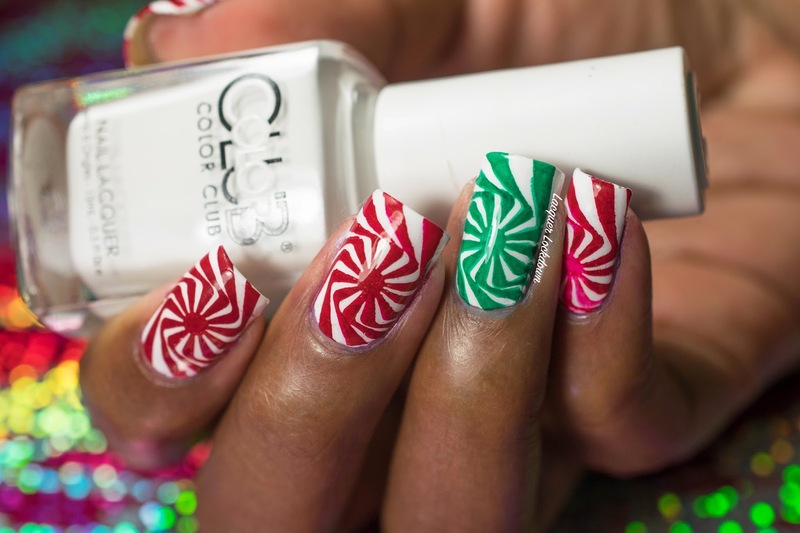 This time I created them using a twist of the Illusions Collections rather than a straight out candy cane plate. 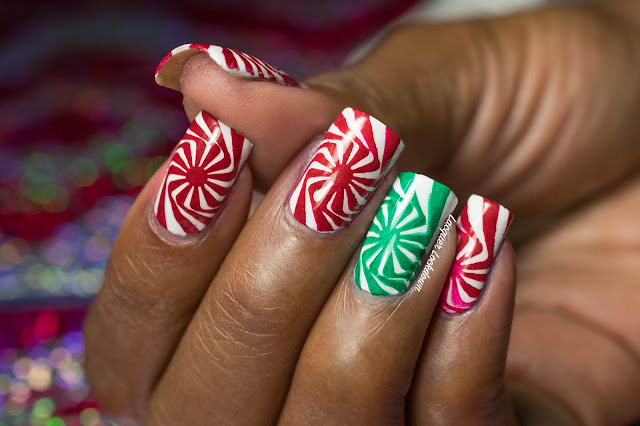 These are definitely a cooler kind of candy cane than the traditional pattern and I really love how they turned out! Finally a quicky tutorial as part of the Simples Series :) Remember I said when the whole point of these simples was to do quick nail art that allowed me to do a lot of fun Christmas nails over the holiday season despite having limited amounts of time in which to create nail art. It's a busy season so nail art like this makes a lot of sense for both myself and many other ladies over the holiday season. That doesn't mean I don't have some much more complicated nail art coming and I definitely do, but it does take me a significantly larger amount of time to create my usual in depth nail art. I definitely want to at a bare minimum do another stained glass mani this season. In any case I hope you enjoyed this minty fresh Christmas mani! I can't wait to share more and definitely if you don't follow me on Youtube channel you should subscribe since I tend to put the tutorials up first before posting them to my blog. It's just a bit easier that way so if you want quicker updates that definitely the way. Enjoy the rest of your weekend and I'll see you on my next post!